Love it and can’t wait to use it in my new house. It’s a mix of vintage with modern! Perfect size for what we needed. I wish it had a wine rack attached tho. The Emory 2-Tier Modern Bar Cart features wooden shelves afloat in midcentury style golden hairpin frames. This metal and wood bar cart provides open storage space for bottles, glasses, and decorative accessories. Locking caster wheels allow easy mobility when entertaining, and ensure the cart will safely stay in place when storing your drinkware or displaying decorative items. 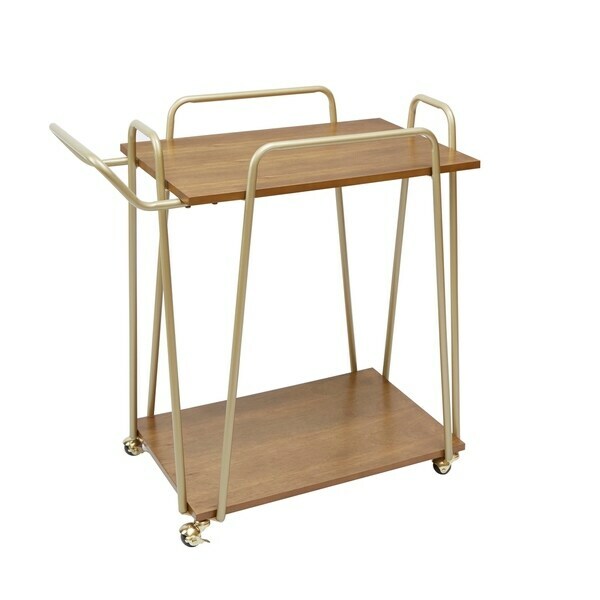 This sleek serving cart brings style and functionality to any dining, living, or home office space. Dimensions 31.0 In. X 18.0 In. X 31.0 In. I love the mid-century look of this cart, and it does look just like the picture, but I am only giving it three stars due the extreme difficulty in assembly. The gold hairpin legs, while a nice touch, do not easily align to the shelves. I had to go through many iterations of adjustment just to get all the legs to attach. Super stylish for not a lot of money — great buy.